Beretta has you covered! 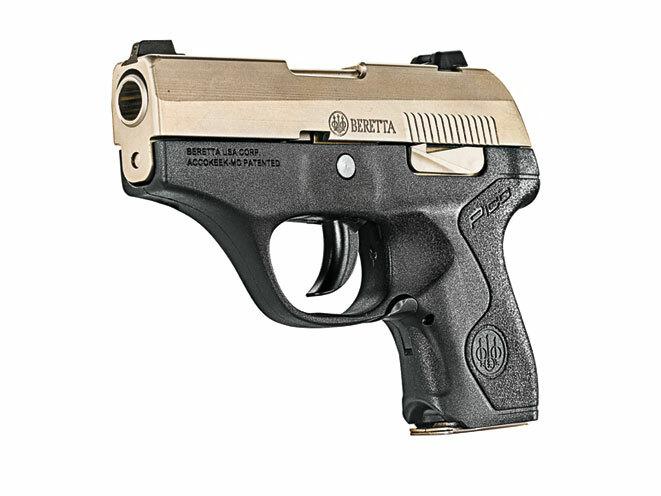 These 9mm, .40 S&W, and .380 ACP guns offer Italian comfort and style. 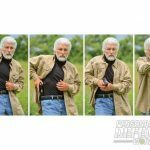 The author shows a concealed carry draw with the Beretta Px4 Storm SubCompact being carried in an Uncle Mike’s size 16 inside the pant (IWB) holster. 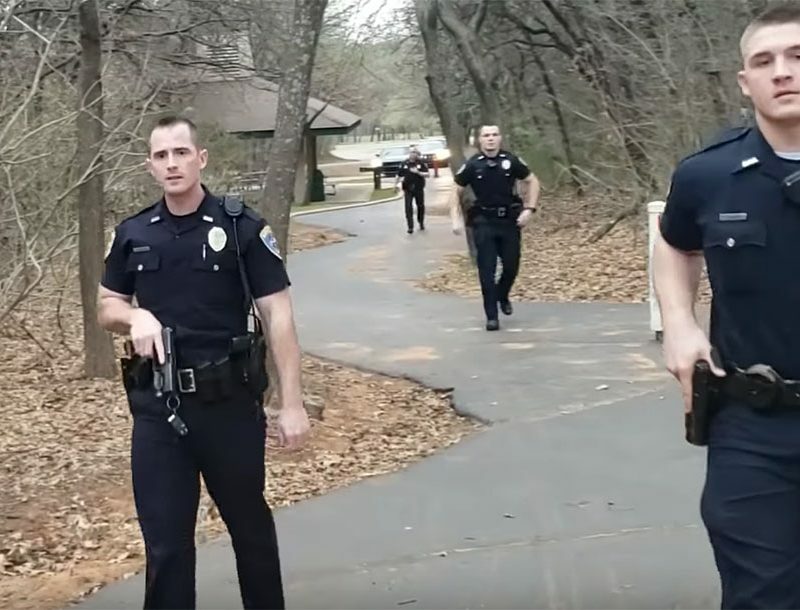 Despite the handgun’s 1.4-inch width it carried comfortably and well out of sight at the four o’clock position. 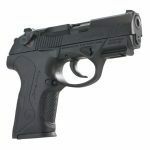 The PX4 Storm SubCompact is among the smallest hi-capacity 9mm and .40 S&W polymer framed handguns in the world with 13+1 and 10+1 capacity. Beretta is the oldest active armsmaker in the world, established nearly half a millennium ago in 1525, but when it comes to semi-automatic pistols, the historic Italian gunmaker waited until the early 20th century before building its first self-loading model in 1915. Beretta’s first small-caliber pocket model was introduced four years later as the Model 1920 and chambered in 6.35mm (.25 ACP), a cartridge developed by John Browning in 1905 for his FN Model 1905. In 1936, Beretta developed the Model 318, followed by the vaunted Model 418 a year later, a pistol, which was to become one of the most popular small-caliber semi-automatics of the World War II era. In the post-war era, Beretta continued to develop new pocket model semi-automaticss in .25 ACP and .22 rimfire, including the single-action (SA) Models 950 and 950B in the 1950s, predecessors to the most famous of all post-WWII pocket models, the double-action (DA) tip-up barrel Models 20, Model 21 and 21A, the latter more popularly known today as the Beretta Bobcat and .32 ACP Tomcat. The Bobcat is chambered in .25 ACP or .22 rimfire. 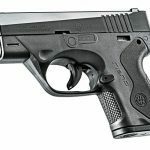 All three are still produced by Beretta and remain among the most popular small-caliber pocket carry pistols on the market. 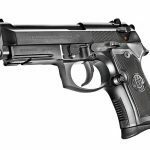 Concealed carry is no stranger to Beretta with its fabled World War II history, but today’s demands for more firepower from smaller pistols led the Italian armsmaker to venture into uncharted waters back in 2005 with their introduction of the first Px4 Storm. 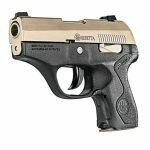 Available today in standard, compact and subcompact variations, the Px4 Storm SubCompact has become one of the most acknowledged of all current Beretta carry models in both 9mm and .40 S&W calibers. 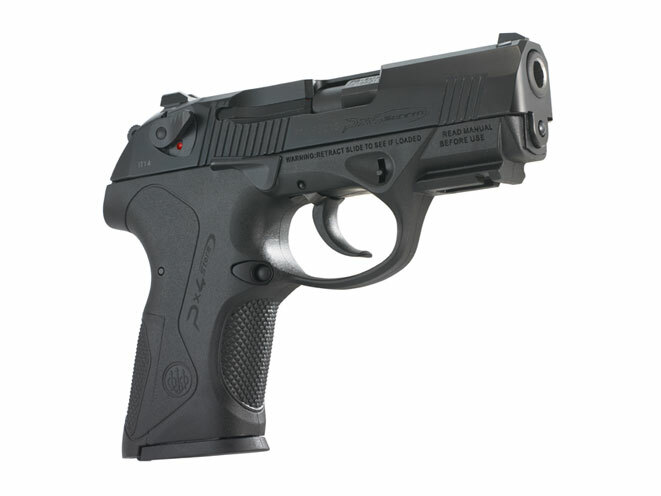 The Px4 Storm Type F SubCompact offers a 13+1 capacity in 9mm and 10+1 in .40 S&W. Styling is a hallmark of Beretta which favors distinctive lines, slide contours and grip profiles, and like all Beretta pistols the Storm is unmistakable for any other. 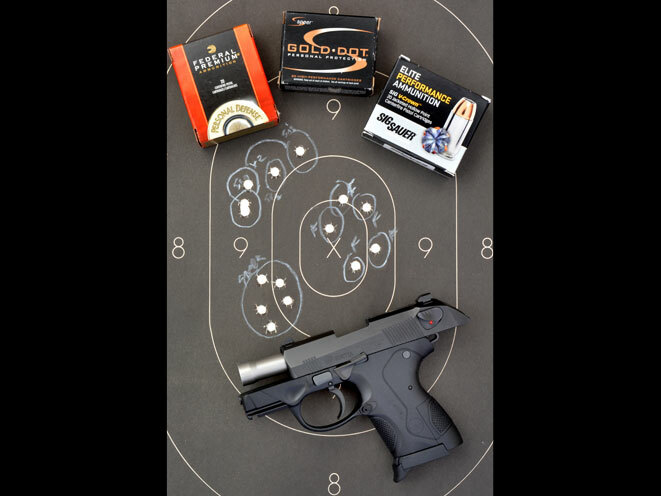 By using a polymer frame, the Px4 becomes one of the most manageable subcompact 9mm and .40 S&W pistols on the market. It is adaptable to right- and left-handed users, has three interchangeable backstraps, a reversible magazine release button and an ambidextrous manual safety lever/decocker positioned on both sides of the slide. In the “safe” position, these also present additional gripping surface for drawing the very short side to the rear. 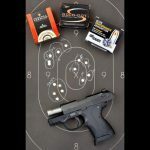 In spite of its diminutive size, just 6.2 inches in length, 4.8 inches in height and a slightly chubby 1.4 inches in width, the Px4 Storm SubCompact was engineered to make recoil management better than most handguns in this size, weight and caliber class. The carry weight is a modest 26.1 ounces (empty). The polymer-framed semi-auto uses a tilt-breech system designed to work in concert with the frame to dissipate both felt recoil and muzzle rise. 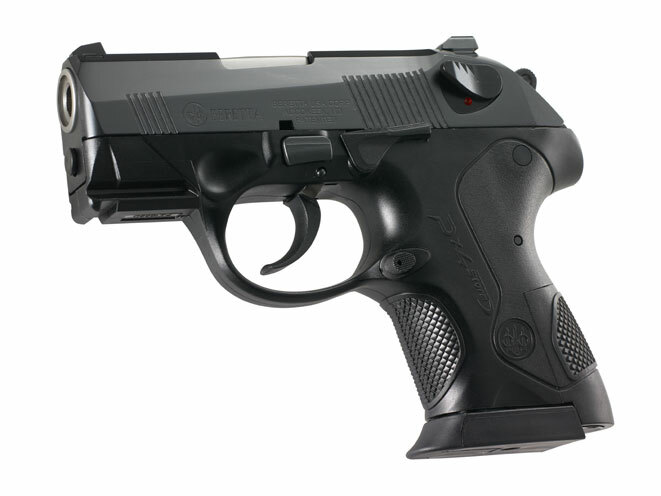 It is also unique in its use of the tilting barrel; all other Px4 Storm models, including the Compact, utilize Beretta’s rotating barrel design to minimize recoil and speed up cycling action. 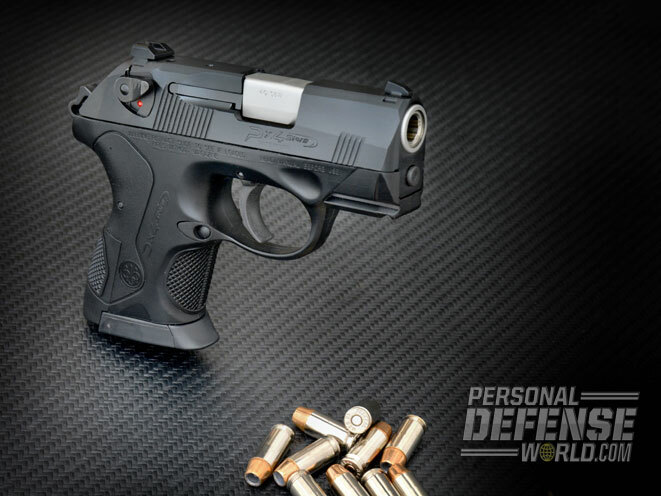 Beretta put a great deal of thought into making a high-capacity subcompact that is truly designed for the rigors of tactical use. One of the most prominent features is an oversized triggerguard and a wide, crescent-shaped pivoting trigger. While the pronounced triggerguard makes holsters limited only to those designed for this model, there is plenty of room in there, even when wearing gloves. 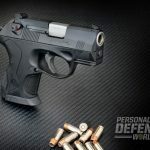 On the test range it became quickly apparent that recoil with hard-hitting .40 S&W rounds feels considerably less than anticipated, and target acquisition was remarkably quick with the Beretta’s dovetailed white-dot tactical sights. Trigger pull in SA averaged 5.6 pounds and 9.3 pounds in DA operation, which is incredibly smooth despite trigger travel in DA being a lengthy 1-inch. Of course, after the first round, it’s all SA unless you decock the gun. 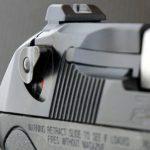 In SA, the trigger automatically moves back 0.5 inches, which cuts trigger pull and reset by half. 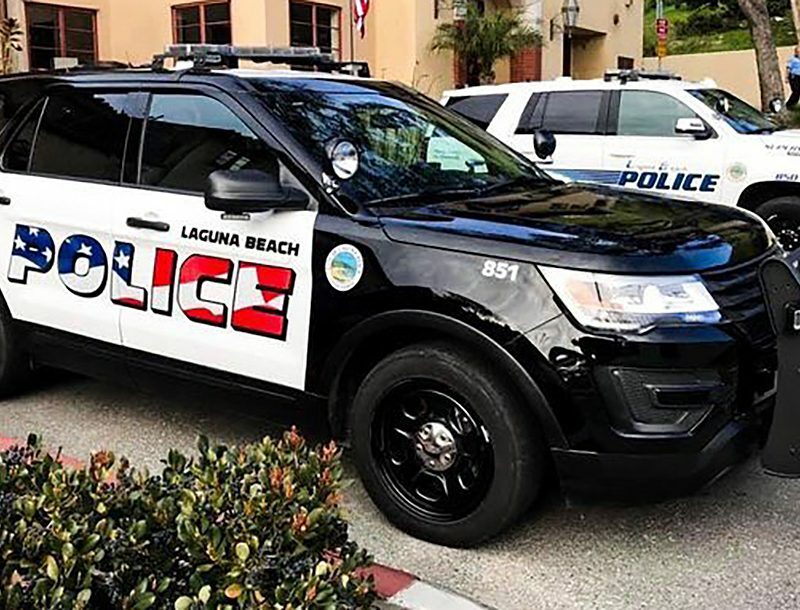 The gun test was done from a distance of 15 yards using new Sig Sauer Elite Performance 165-grain JHP, which clocked 970 feet per second (fps) from the Px4’s 3-inch stainless steel barrel. Federal Premium 180-grain Hydra-Shok JHP traveled downrange at 915 fps, and Speer Gold Dot GDHP at 900 fps. The best five-round groups on a full-size Speedwell B-27 silhouette target measured 2 inches with Federal, 1.95 inches with Speer and 2.55 inches with Sig Sauer. All shots struck in center body mass and were fired at one-second intervals using a Weaver stance and a two-handed hold. Overall, for a 10+1 capacity subcompact in .40 S&W, the Beretta Px4 Storm is one of the best polymer-framed semi-autos available for concealed carry and backup tactical use. 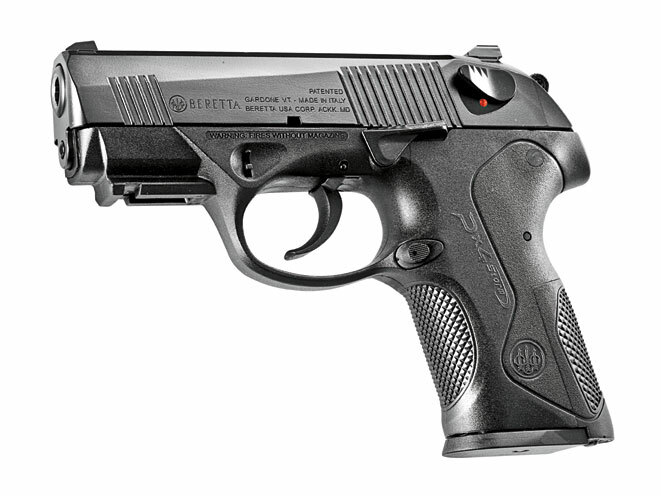 With the Px4 Storm Compact pistol, Beretta has a higher capacity model still ideally suited for concealed carry use. 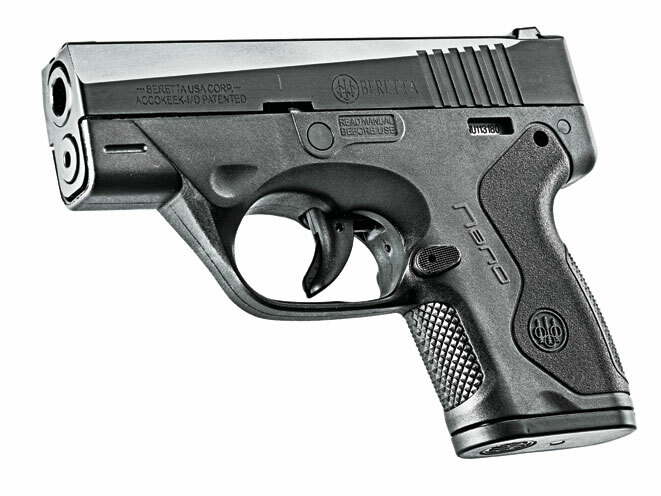 Though it is completely concealable, the Compact offers a full grip for most shooters. The Compact offers full 15+1 capacity (12+1 in .40 S&W), an accessory rail, ambidextrous slide stop, a new integral and retractable lanyard loop and a cold-hammer-forged barrel for ultimate precision. The Compact also houses the Px4 family’s rotary barrel system. This system allows for in-line feeding for unparalleled reliability and leads to radial dissipation of recoil energy, resulting in a significant reduction in felt recoil and fast follow-up shots. Features also include three-dot sight system, a reversible magazine release, Commander-style hammer, interchangeable backstraps, ambidextrous safety and a non-reflective, black Bruniton finish. 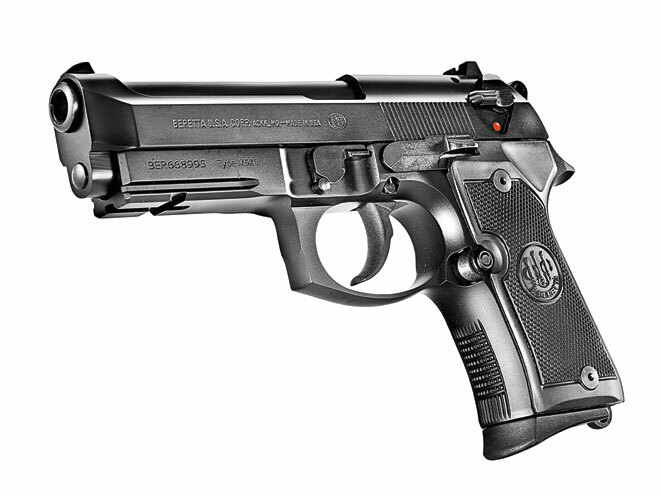 The Beretta Model 92, or M9 as it is known by the U.S. Armed Forces, has been our country’s standard issue sidearm since 1985. 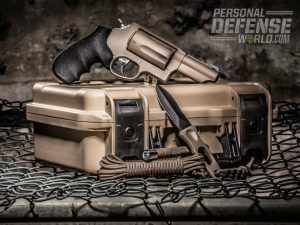 Regarded as one of the most iconic battle pistols in the world, the Model 92FS is offered in a Compact version with a Mil-Std-1913 dustcover rail. Combining some of the best features of the distinctively designed open slide semi-auto, the 92 Compact is an excellent off-duty carry gun with a standard capacity of 13+1, overall length of 7.75 inches with a 4.25-inch barrel, height of 5.25 inches, width of 1.5 inches and, with its aluminum alloy frame, a carry weight of 31.6 ounces (empty). Compared to its full-size counterpart, the Compact is a full 0.75 inches shorter and 2.3-ounces lighter, making it even more comfortable for all-day carry. Also, its shorter trigger-reach will make it simple to shoot for users with smaller hands, even for that first DA pull. The magazine well is beveled, for lightning-quick tactical magazine changes without taking your eyes off the target. The combat triggerguard facilitates the use of the handgun while wearing gloves and provides secure placement for the off-hand. The front and backstrap are checkered to ensure a positive and consistent grip. While large by today’s concealed carry designs, the Model 92 Compact with Rail is an easy handgun to handle and shoot accurately. 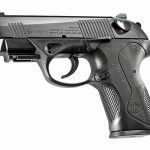 Beretta has been making medium-frame DA 9mm and .380 ACP semi-automatic pistols for decades, but scaling down a 9mm was a first for Beretta in the 21st century to meet the demands for concealed carry pistols in larger calibers. The Nano is smaller than any 9mm ever manufactured by Beretta, a mere 5.63 inches in length, 4.17 inches in height and 0.90 inches in width. For a 6+1 capacity 9mm, those are close tolerances. To put that in perspective, a .32 ACP Beretta Tomcat measures 5.4 inches in overall length, 3.6 inches in height and 1-inch in width. The Nano is also light at 19.8 ounces (empty) because the frame is polymer. The gun utilizes a one-piece molded technopolymer frame surrounding an independent stainless steel fire control sub-chassis containing frame rails, trigger and striker firing system. This sub-chassis is removable and serial numbered, allowing owners to switch outer frames for different colors and options such as a LaserMax laser or a tactical light built into the interchangeable frame. Because of the separate exterior shell, the Nano is not as small as it could have been compared to other subcompact 9mm pistols. What the Nano does offer, without making any compromises, is the most foolproof and easiest-to-handle semi-auto design on the market. As uncomplicated as possible, it has no external (manual) safety or even a slide release lever. All it takes to strip the first round from a magazine on the reload is pulling the slide slightly to the rear and letting go, which basically makes it ambidextrous. There is an easily depressed magazine release that is reversible, and the Nano has no magazine disconnect, so it can fire a chambered round with the magazine removed. A large, curved triggerguard makes getting to work quick business even when wearing a glove, and there is still ample room for a two-handed hold with plenty of clearance behind the muzzle of the 3-inch barrel. Aside from its unique fire control sub-chassis, the Nano is otherwise quite conventional, employing a striker-fired, short-recoil system combined with a blade trigger safety and automatic striker block. To help mitigate harsh recoil from the lightweight 9mm, Beretta uses a double recoil spring. As a defensive sidearm for concealed carry, the Nano couldn’t be any easier to use without being a revolver. Since the Pico followed the Beretta Nano, the name implies something even smaller: a “nano” is one-billionth of any measurement, a “pico” is one-trillionth. The name gets the point across—this is one very small concealed carry .380. The Pico has the same basic construction as the Nano with an interchangeable, one-piece, molded technopolymer frame surrounding a separate and removable stainless steel fire control sub-chassis. 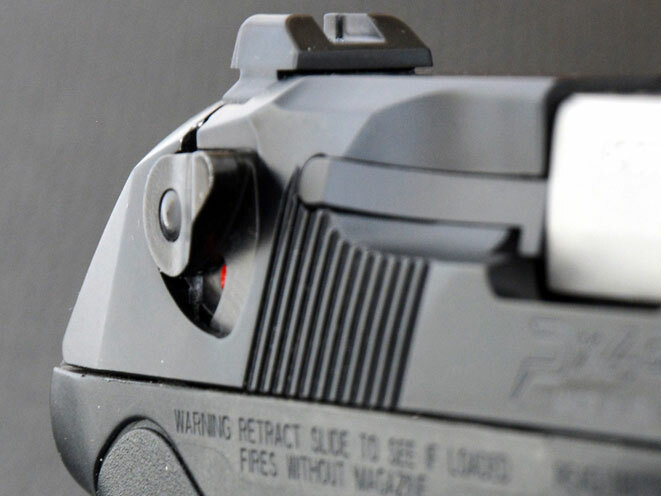 The Pico frame can also be changed for frames of a different color or those with built-in accessories like a LaserMax laser or tactical light. The little 6+1 capacity .380 even has interchangeable, dovetailed white-dot sights. That feature alone sets it apart from most of the competition in this size and caliber. The gun also shares another Nano feature, a remarkably simple takedown procedure. There are no levers or pins, no alignment points, no tools required; there’s just one large slotted screw on the right side of the frame, which, with a quarter turn counter-clockwise (using the edge of a shell casing), allows the slide, barrel, recoil spring and guide rod assembly to be pulled forward off the subframe. The screw even automatically rests to the locked position when the assembly is slipped back onto the frame rails. It doesn’t get much easier. The Pico uses an internal, hammer-fired, short-recoil system. It is a double-action-only (DAO) design and has no manual/external safety. When it gets down to length and height, the Pico again deserves its name, as it measures a mere 5.1 inches in length, a scant 0.72 inches in width and weighs 11.5 ounces (empty). From the top of the white-dot rear sight to the base of the magazine well, the measurement is 3.875 inches. How small is the Pico? One could hide the Beretta in the shadow cast by a Ruger LCP. Now that’s really small! 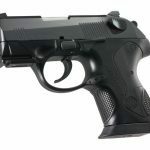 For more information, visit http://www.berettausa.com or call 800-929-2901. 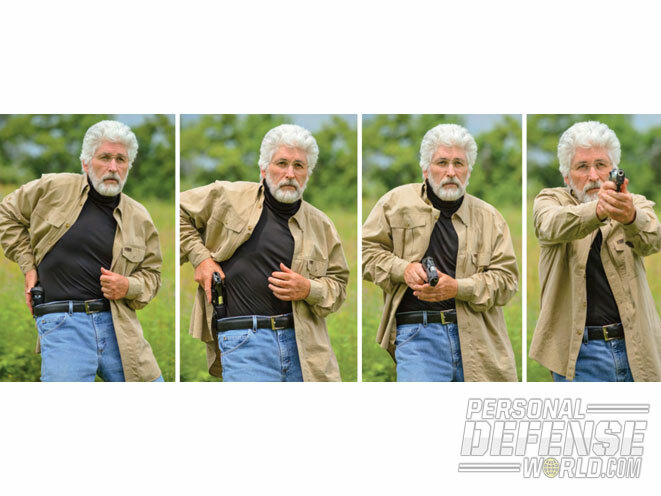 This article was originally published in CONCEALED CARRY HANDGUNS 2015. Subscription is available in print and digital editions below.